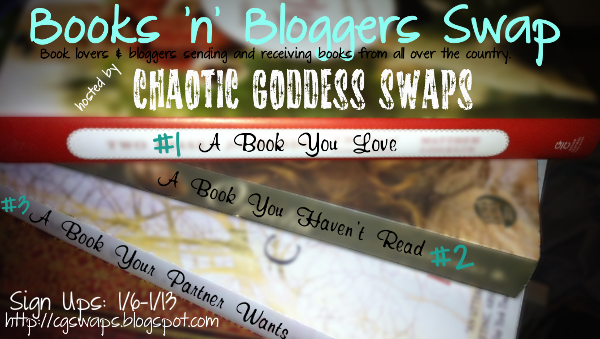 One of the things I LOVE about blog swaps is meeting new (to me) bloggers. Some of them as fascinating, some are hilarious, some are inspiring, some are encouraging...you start digging into your swap partner's blog and/or exchanging emails and BAM! totally new person to open your perspective on life. And sometimes you find a blogger who has excellent taste in books, whose Goodreads reviews you find yourself nodding along to. Or whose reviewed books you feel you mustmustmust put on your TBR pile because they have fantastic taste in books and they loved it, so clearly you will, too! Kristina at Gone Pecan is just such a swapper. Seriously- any of you who have similar bookish taste to me, you need to follow her reviews. And also, she spoiled me rotten. I mean, it's a theme (maybe this is a host thing?? please don't feel pressured to spoil me, if we're swap partners!) for the past 2+ years I've been spoiled by generous, thoughtful swappers. But when I came home from an already amazeballs couple of days to find her package? I squeed. Loudly. She found ALL books that I have wanted to read, despite only one technically on my wish list (the others were on my library TBR list). The Winter Witch, The Witch's Daughter, Shadow & Bone, Dark Places, and a gorgeous dragon journal.